Ice Dam Steaming Gun - Can You Spot A Steamer? An ice dam steaming gun, commonly referred to as a wand, offers a unique distinction. This distinction sets apart low pressure steamers from hot pressure washers. As a property owner it’s very important to know the different between the two guns. As pictured to the right, you can see that an ice dam steaming gun does not have a trigger like a pressure washer. A pressure washing gun is something nearly everyone has held in their hands in a car wash. You will note that pressure washers will have a trigger on the gun handle. This is a simple distinction. This makes it simple to distinguish between a low pressure steamer and a hot pressure washer. 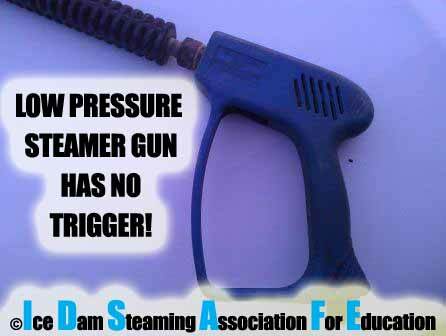 Simply put, a low pressure steamer will never have a trigger. As an ice dam steaming association, we feel this information is very important. You now have ammo when questioning companies on the phone. We feel this should be the most common questions that you ask to discern good companies from bad. Ask, – Does your gun have a trigger? If they answer this question with a “yes,” it is strongly advised to find another company that does not use pressure washers. All member of this association are verified and run the right low pressure equipment. If you find our logo on a company’s website it will be clickable and direct you back to this association. On our site you will be on a special page that verifies they are a member in good standings. This verification procedure protects the association from companies stealing the logo and making false claims that they are a member. Every clickable logo that directs you back to this association will be genuine and can be fully verified. Each member must go through extensive verification procedures before they are allowed to become a member. We created this association to help you prevent roof damage from high psi pressure washers and other forms of ice dam removal. We hope this information about ice dam steaming guns helps you make a smart decision when hiring. Please look for our members when hiring ice dam removal companies. If you have questions or need help locating our members please contact us now. We reply quickly!